In the KombiKorma of January 2016 Van Aarsen is mentioned in a rather large article concerning the Feed mill build for Agroeco. Since this article is solely available in Russian we provided a summary in English, please see below. Agroeco group of companies was founded in 2009. And today it consists of 5 modern production facilities with the capacity of 650K pigs (or 78K tons of live pork) annually. 6 more pig farms will be commissioned in 2016. 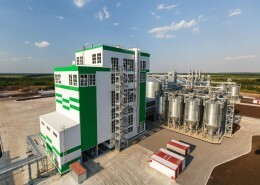 Last year in June a new feed mill was commissioned in Voronezh region (Talovaya). Its main task is to provide safe clean feed for Agroeco pig farms. The feed mill capacity is 290K tons per year. Our correspondent visited this feed mill and talked to the feed mill managers. She was surprised to see such a modern feed mill in Russian province. The building colour (corporate green) attracts attention from distance. The top priority in production is feed safety and quality. Raw materials and finished feed follow different routes which never cross. For safety reasons it is prohibited for all the company employees to have pigs in their household. As a compensation they can buy pork from the company at the production cost. 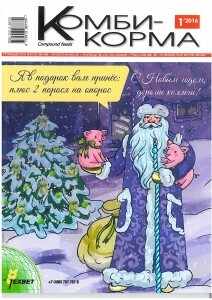 Agroeco uses its own recipes depending on pig breed and productivity. Raw material intake. Grain storage. Daily raw material intake starts with sample taking from trucks. The grain storage has a capacity of 90K tons, of which at the moment 60 K tons are used. This section consists of 12 metal silos (5K tons each) providing 2 months stock. Meal materials are stored in 16 silos with vibrating bottoms, temperature indicators and active ventilation. Two separate intake lines allow to intake 2 different products at a time, e.g. barley and wheat. Therefore, there are two cleaning lines, two drying lines and 2 transport lines to the feed mill. Process and transport equipment for the feed mill is supplied by the world-famous manufacturer – Van Aarsen (the Netherlands). It was chosen from a number of potential suppliers because of the optimal “price-quality’ ratio. Van Aarsen supplied everything up to electric cables. Cleaned raw materials are transported to the feed mill building via 3 transport lines. Below the raw material silos there are 4-, 2- and 1-ton weighers. Dosing is performed with both screws and dosing slides. For micro dosing SID and MID units (each for 8 components) are used. The system is compact and occupies little space. It is planned to extend the micro dosing section with an extra MID+PID unit. For grinding 2 hammer mills (20 t/h each) are used. For mixing a 2-shaft 4-ton mixer is used, which provides 99% mixing homogeneity. After the mixer product goes to 2 pelleting lines with C900 pellet mills (20t/h capacity each). Die diameter varies from 2,2 to 4,5 mm. After cooling pellets go either to 24 finished feed silos or to one of the two coating lines. Process and transport equipment is provided with magnets and spot filters for industrial safety. Aspiration systems are also supplied by Van Aarsen. New Van Aarsen automation system controls the whole process. Due to the pig farm facility increase it has been decided to extend the feed mill with a new production line supplied also by Van Aarsen. 2 operators control finished feed off-loading. Finished feed off-loading with pneumatic loading bellows is completely automatic. Quality and safety control of raw materials and finished feed is performed at all the production stages from the intake to off-loading. The laboratory is equipped according to the latest standards. As a conclusion: the feed mill in Talovaya is a complete facility with its own infrastructure, providing continuous operation. Agroeco is a young, but ambitious company, which has achieved noticeable results within a few years and nowadays it is among the three leading companies in terms of costs, production output and quality. Considering the company development pace we wonder whether Agroeco would stop with only 1 feed mill in Talovaya?